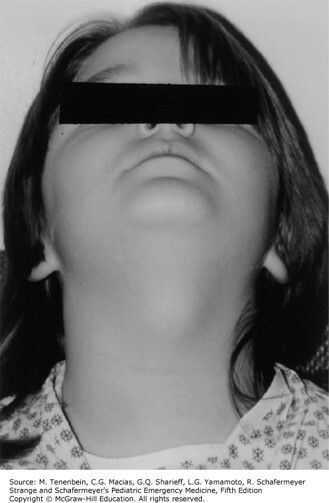 She reports that the child has a history of recurrent midline neck swelling for the past several years. The patient was healthy until last week when she developed a low-grade fever, rhinorrhea, and coughing. Mom then noticed a prominent midline neck swelling that appears erythematous and tender to palpation. You observe that the swelling moves upward when the patient sticks out her tongue during your exam. B. Infected brachial cleft cyst. E. Infected thyroglossal duct cyst. The correct answer is “E.” The differential diagnosis for a pediatric neck mass is extensive and most easily understood by grouping into broad categories of infectious or inflammatory neck masses, congenital neck masses and neoplastic neck masses. (See Table 9–8.) A thyroglossal duct cyst is an epithelium-lined cyst resulting from the persistence of any segment of the thyroglossal duct along its migration from the foramen cecum of the tongue to the pyramidal lobe of the thyroid. It is the most common midline neck mass in children. Remember that, during formation, the thyroid migrates down from the base of the tongue to its location in the neck. Thyroglossal duct cysts are typically found near the level of the hyoid bone in the midline of the neck. Clinically, they most often appear as a painless, fluctuant midline neck mass that moves upward with a protruding tongue or during swallowing. It is important to evaluate thyroid function because thyroglossal duct cysts may contain ectopic thyroid tissue with associated hypothyroidism. By comparison, branchial cleft cysts are round, smooth, mobile lateral neck masses found along the anterior border of the sternocleidomastoid muscle. Most of these arise from incomplete obliteration of the second branchial cleft. Patients may have a history of recurrent swelling or infection in the same lateral neck area. Both thyroglossal duct cysts and branchial cleft cysts are often asymptomatic until they become infected in the setting of an upper respiratory tract infection. Acutely infected cysts require antibiotics to cover typical skin flora and anaerobes. Definitive treatment is elective surgical excision. A cystic hygroma or lymphangioma is a painless lymphatic malformation commonly located above the clavicle. Question & Explanation: Peterson AR, Wood KE. Pediatrics Examination and Board Review. New York, NY: McGraw-Hill Education; 2017. Photo: Tenenbein M, Macias CG, Sharieff GQ, Yamamoto LG, Schafermeyer R. Strange and Schafermeyer's Pediatric Emergency Medicine, 5e; 2019.